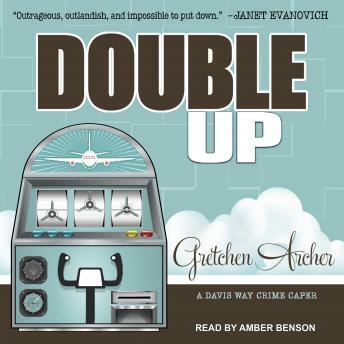 On behalf of USA Today bestselling author Gretchen Archer, welcome aboard flight Double Up. Fasten your seat belts for non-stop action as stiff competition blows into town and the resulting turbulence threatens to take down the Bellissimo Resort and Casino in Biloxi, Mississippi. Super Secret Spy Davis Way Cole, who lives on the twenty-ninth floor of the hotel with her CEO husband and newborn twins, takes it hard. If the casino goes belly up, she won't be a stay-at-home mom because she won't have a home. Not to mention, her husband won't have a job. Davis can't find a way to stop the inevitable end of the Bellissimo life she loves until her ex-ex-mother-in-law shows up, unexpected and definitely uninvited. Davis makes the best of a bad Bea Crawford situation and recruits her for a little corporate espionage work, which would've been great, had Bea not turned out to be the world's worst spy. Ever.